A late-summer afternoon, a garden full of friends and family, and tables arrayed with the exquisite beauty and unmatchable taste of vibrant heirloom tomatoes. Sound intriguing? Heirloom tomatoes are popular in gardens and at farmers' markets alike. They're distinguishable from the more familiar red supermarket orbs by their origins (heirloom tomatoes are not hybrids) as well as their dizzying range of colors, sizes, and shapes. But their diversity of flavor is what's truly captured our stomachs. An heirloom-tomato tasting party lets guests sample dozens of tomato varieties at once, in a grand and unique celebration of flavor. Here are eight party-planning tips for throwing your own tomato tastefest. #(clear n1). Hold your horses. Not to belabor the obvious, but you can't host an heirloom-tomato tasting party until your local tomatoes are ready — which means late summer or even early autumn in most parts of the U.S. I know, I know, the weather is so nice in midsummer, and you really want to eat a tomato — but patience, patience. #(clear n2). 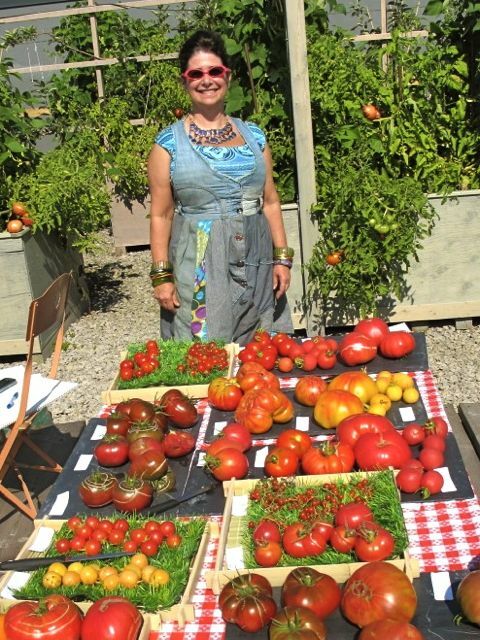 [%image vivian float=right width=400 caption="Vivian Reiss at her heirloom-tomato tasting."] Tot up your tomatoes. It’s probably impossible to have too many heirloom-tomato varieties on display, although your guests' palates might tire after sampling several. Slice up a few dozen of your favorites and arrange any others for display. #(clear n3). Select your varieties. Your options may be dictated by what's available in your garden or your local farmers' market. But keep an eye out for the following. 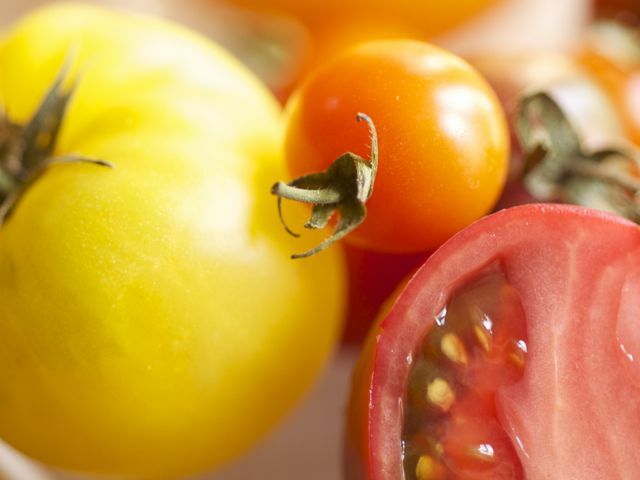 Barlogio's favorites include Cherokee Purple (a medium-sized purple beefsteak variety prized for its flavor), Black Krim (a large dark tomato), and Amy's Sugar Gem (a prolific variety with clusters of small red tomatoes). Reiss's favorites include Paul Robeson (a popular black tomato of Russian origin), Gold Medal (a large golden tomato), Anna Russian (a heart-shaped, medium-sized pink Russian tomato), and Giant Belgium (an extremely large, deep-pink tomato). Some of my favorites include Green Zebra (a tangy green striped tomato), Wapsipinicon Peach (a small yellow tomato with a peachlike fuzz on its skin and delightful taste), and Beam’s Yellow Pear (a prolific pear-shaped tomato with good flavor). #(clear n4). Crunch your numbers. How many tomatoes should you serve per person? Much depends upon the size of the tomato, says Barlogio. Reiss agrees: “One large tomato will do of each variety, or more if they are cherry tomatoes,” she says. #(clear n5). Set your scene. Provide plates, forks, napkins, and possibly salt, although Reiss believes that heirloom tomatoes are best served unadorned. 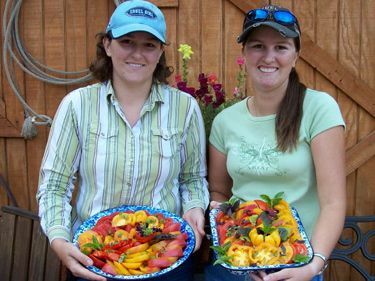 [%image girlswithtomatoes float=right width=500 caption="Sisters Becky (left) and Mandy Barlogio grew their own tomatoes from seed. "]Consider providing other beverages — tea or lemonade, for instance — as well as artisanal crackers and cheeses for light munching as your guests sample the tomatoes. If you want to go all-out, put someone in charge of a large grill and have brats, buns, and toppings available for a main course. Put someone else in charge of providing dessert — maybe something light, such as freshly made sorbet with crisp cookies. #(clear n7). Diversify your offerings. Shocking, yes, but some people just don't dig tomatoes. For these guests, prepare a small tasting table focused on a different seasonal fruit, such as three or four varieties of heirloom cucumbers or heirloom sweet peppers. Try, for example, a selection of Jimmy Nardello, King of the North, and Purple Beauty sweet peppers. If you're doing the barbecue option, try grilling up more of those peppers for sausage sandwiches. #(clear n8). Plan your next shindig. Not satisfied with what you got from your garden or local markets this summer? Plan ahead for next year by shopping for heirloom seeds at Baker Creek or seeds and seedlings at Seed Savers Exchange. Aim for the widest range of colors, shapes, and sizes you can find. p(bio). Samantha Johnson is a freelance writer and the author of several books, including a forthcoming book on gardening for children. She raises horses, rabbits, and heirloom tomatoes in northern Wisconsin.